The bacon adds amazing flavor to this Kale, Bacon, and Cheese Breakfast Casserole, and I love starting out the day with kale! And this tasty breakfast casserole is low-carb, Keto, low-glycemic, gluten-free, and South Beach Diet friendly! Use the Diet-Type Index to find more recipes like this one. Click here to PIN Kale, Bacon, and Cheese Breakfast Casserole! 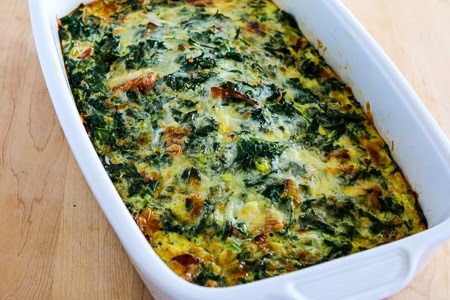 I love the addition of bacon in this Kale, Bacon, and Cheese Breakfast Casserole. Yes, bacon isn’t really allowed on South Beach, and if you’re one of those South Beach Diet fans who believes in following the absolute letter of the law you should use Canadian bacon or turkey bacon to make this dish. And of course if you’re following a LCHF or Keto diet you’ll welcome the addition of bacon and want to add more. Please, feel free to use more or less bacon to give this breakfast casserole amazing bacon flavor! If there’s one thing I believe, it’s that everyone gets to make their own food choices. And personally I’d have a hard time sticking to an eating plan where I couldn’t eat bacon again for the rest of my life. And of course there’s a huge amount of uber-nutritous kale in the recipe, so I hope I can get a few points for that! Wash kale and cut into thin crosswise strips. Heat some oil in a pan and when it’s very hot, add the kale all at once. (It will look like a huge amount of kale, but it wilts down very quickly.) Cook the kale 1 or 2 minutes, just long enough to wilt it down. Microwave the bacon until it’s crisp and then blot away as much fat as you can. Bake 22-25 minutes until the eggs are set and the casserole is starting to brown on top. You can’t really tell in this photo, but the center may puff up when the casserole cooks. It will settle down when the finished casserole cools a bit. Serve hot, with a dollop of low-fat sour cream if desired. It doesn’t take a lot of bacon to add amazing flavor to this Kale, Bacon, and Cheese Breakfast Casserole, and I love starting out the day with kale! Preheat oven to 375F/190C. Spray a medium-sized glass or crockery casserole dish with nonstick spray. In the sprayed casserole dish, layer kale, crumbled bacon, and cheese. Break eggs into a bowl or large glass measuring cup, season with salt, pepper, and Spike Seasoning (if using), and beat eggs well with a fork. This will keep at least a week in the fridge and can be reheated in the microwave. Don’t heat more than a minute or two, or the eggs will get rubbery. Before you make this you may want to read Basic Instructions for South Beach Diet Friendly Breakfast Casseroles which has instructions for different sizes of pan and ingredient options for this type of breakfast casserole. I like Veg-Sal and Spike Seasoning in breakfast casseroles like this, but regular salt and any all-purpose seasoning that’s good with eggs will definitely work. 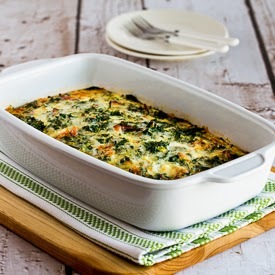 Kale, Bacon, and Cheese Breakfast Casserole should be great for most low-carb and low-glycemic eating plans, even Keto. Even though bacon is not really permitted for the South Beach Diet I think if you use very crisp bacon with the fat blotted off with a paper towel, this is acceptable as a once-in-a-while-treat. You can also make it with Canadian bacon or turkey bacon if you want to follow South Beach more strictly. I could eat this for breakfast every morning, too. Eggs and kale has become one of my favorite food combinations. Katie, thanks for letting us know that making it ahead worked so well! I tried making it ahead and thought it turned out great! I followed the recipe up until the baking step, then refrigerated overnight. In the morning I baked a little longer to make up for it being cold instead of room temp. My whole family loved it and I'm sharing the recipe with a friend! Thank you! I hope your arm heals quickly! I haven't tried making it ahead, but I think I'd prep the other ingredients and then pour the eggs over in the morning if you want to make ahead. Has anyone tried making it ahead (putting together the night before) and then baking the next morning? Didn't know if putting all the ingredients together night before would change the texture or ruin it somehow…thanks! RJ, so glad to hear it was a hit, thanks! 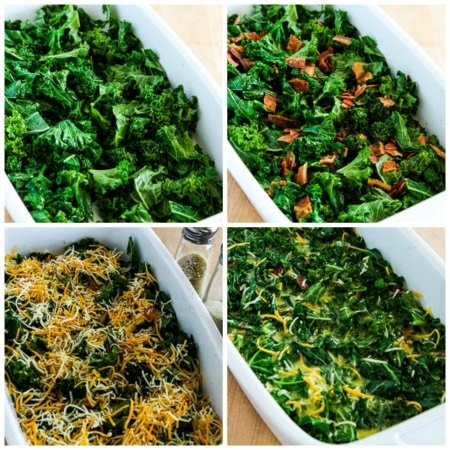 Kalyn, I just had to come back and comment on this kale casserole. Its just delicious! I planned it for my main dish along w/a salad for my evening meal. My DH who is a very fussy eater who I thought wouldn't even taste it,ate half of it! I think the bacon did the trick for him after smelling it while I cooked. Just needed to let you know it was fab and one of our favorites now. Thanks as always. S excited to try this in a few minutes, was looking for a recipe with these ingredients. Anna, glad you liked it. Thanks for letting us know it was good with mustard greens. Just made this with mustard greens; so great with bacon! Maybe I'll actually try it with kale next time. Kale is about the healthiest thing you can eat; it's loaded with nutrients. Hope you enjoy it in this! This looks so good! I have never tried Kale or even cooked with it so it will be interesting!! Thanks for sharing!! Emily, glad you enjoyed it. I recently drove 2 hours to get to a Trader Joe's store (our town is a bit lacking in the grocery department) and picked up 3 10 oz bags of prewashed, stemmed and cut kale. What a luxury, since I don't have a garden! This casserole was a fantastic use of one bag, but it only served 6 in our house of big eaters. I had pullet eggs from the farmer's market and had to use 13 because they're so small, but it was lovely. Monica, me too and my garden is still exploding with kale so I'm still experimenting with it! Glad you like this idea. I'm always looking for ways to incorporate more kale in my cooking. This looks fabulous. I'll definitely make mine with bacon! Barbara, hope you enjoy it! I just got a bunch of Kale in my organic food delivery and needed a recipe. This looks great; will have to try it! Anything with bacon is good. But i love that there is cheese and kale in this recipe. I will try this recipe out for sure! Katie, this is my first year growing the dark green kale, and I'm loving it. When you have it in the garden you can pick the leaves when they're fairly small, and they are so delicious. I can see I'm going to have to add kale to me garden next year. I've never seen it for sale here and I've been reading about it all summer. I'm intrigued. Hope you enjoy it as much as I have! I've had it for breakfast the past couple of days and am loving it! I try not to post until I've actually tried a recipe but this looks so awesome I couldn't resist giving you a prebake shout out!!! Can't wait to try this! Kieran, your recipe sounds really healthy! I do think the flavors of bacon, kale, and eggs go so well together. This sounds like my favourite breakfast the past few weeks: a massive handful of kale, a slice of turkey bacon, a few egg whites, and low-fat cheese, all scrambled together. Delicious! I never even thought to make a casserole out of it, can't wait to try it! Dara, I just had some for a late breakfast and this may be my new favorite way to eat kale! 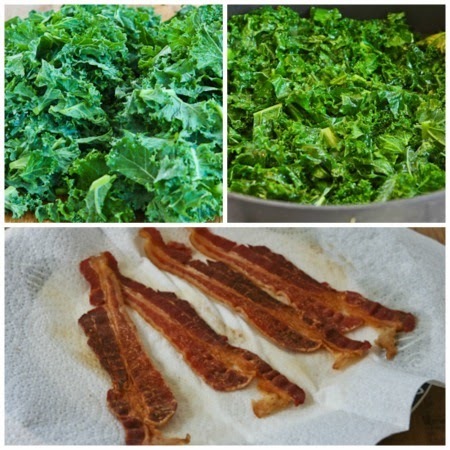 Bacon and kale – now that sounds like a fantastic combination of flavors! Well Dave is moderation is the key, my bacon consumption is definitely pretty moderate! If you don't want bacon I might make Kale and Feta Breakfast Casserole. I'm not that familiar with meat substitutes, so I don't know what would sub for bacon. Love the cheesy top of the casserole! How and with what can I replace the bacon in here, Kalyn? Diana and Miss T, Not surprised that I'm not the only one who has noticed that kale and bacon taste great together! Kale and bacon! yes please! Kale and bacon really do compliment each other. They're also great together in stir-fries! I made this just last night but subsituted what I had onhand. I couldn't bring myself to use 18 eggs, so I did 9 eggs and 2 1/4 cups eggbeaters. I used andouille sausage instead of bacon, sauted with 1/2 yellow onion and some leftover asparagus. It was delicious! Everyone in the family loved it. It was a nice change from the meat & 2 veg routine of South Beach. Anonymous, I’ve never had the cheese and other ingredients float to the top. That sounds like too much egg to me, but not sure what happened. I made this dish and I think I stirred the ingredients too much. The onions, bacon and cheese just floated on top of the egg and were not evenly distributed! Has this happened to anyone else? t-wan, the recipe says 8-10 servings, but you could definitely cut it in half if you used a smaller dish. I have frozen this type of egg casserole. It releases some water when it’s reheated. It’s not bad, but I prefer it not frozen. It will keep in the fridge for at least a week. I’m wondering if you can guessimate how many servings this makes (it’s just me and the hubby and this seems like a lot). I’m also wondering if you’ve tried freezing this casserole and if so what were you’re results. This sounds so good and I’m like you I can’t give up the bacon completely. I will definitely give this one a try. I would think you could use turkey bacon in this and get the same effect as regular bacon.